Is there a better alternative to SyncChef? Is SyncChef really the best app in Cooking category? Will SyncChef work good on macOS 10.13.4? 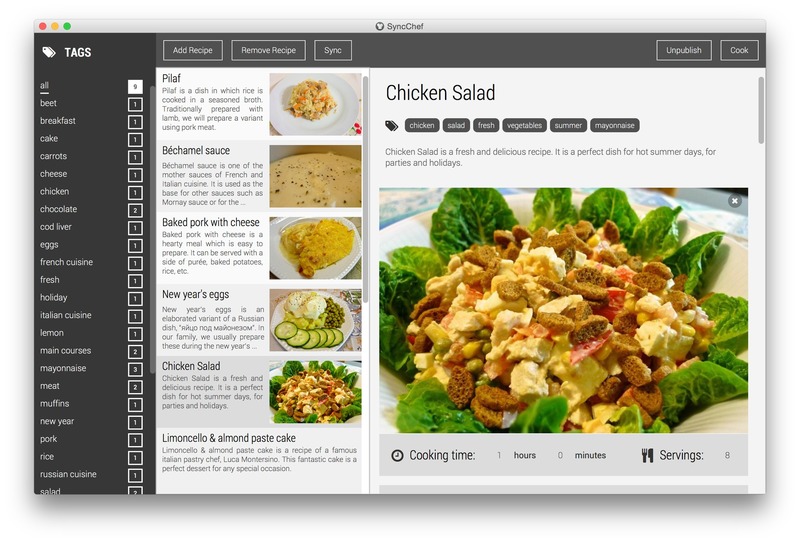 SyncChef is the easiest to use recipe manager out there, and is very powerful, too! Not only does it allow you to write down and organize your recipes, it also comes with the ability to backup your recipes remotely and synchronize them to all your devices. A unique feature of SyncChef, is the ability to publish your recipes on your blog on SyncChef.com and share them with the world! You can see an example of a SyncChef.com blog here. SyncChef needs a review. Be the first to review this app and get the discussion started! SyncChef needs a rating. Be the first to rate this app and get the discussion started! SyncChef is still in beta and is currently being sold at a promotional price. Users of the beta version will get free upgrades to version 1.0 as soon as it is released. Your feedback is very welcome and will indeed influence future features and help us sort out priority. Although the software has been tested, being a beta, it may have some bugs. Make sure you report them to us and we will fix them as quickly as possible.